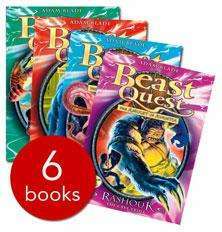 The ever popular Beast Quest series is now back in stock at the BookPeople for just £6.99 for series 4, 5, 6 or 7. Note, it is £6.99 for each of the series! This is a cracking deal though as it works out at just over £1 per book. Shame I purchased two of the series for double the price just last week. Argh!! Also, 3% cashback and free delivery through Quidco with code AFFREE2. Free standard delivery on orders over £25 anyhow. fab price. my son bought them from smiths....pricey!! Excellent Price. They are going for £10 plus on ebay for 2nd hand. Ordered the latter series as DS1 has started getting into them. I paid £7 odd for 2 the other week! Ordered ! Cheers op ! Deal posting newbie! This is themilnes first deal post. Help out by leaving a posting tip or just to show your appreciation for their contribution.